What can I send to Lithuania? What items are restricted? Whether you are planning to visit Vilnius for a couple of days, or spend longer enjoying an activity holiday in Lithuania’s forests, Send My Bag can help make your journey a speedy and efficient one. You can have your luggage picked up from your doorstep or office and have it delivered to your hotel, ready and waiting for your arrival. You can also avoid the possibility of excess or oversized baggage fees by sending your sporting equipment, including hiking gear and bikes, to Lithuania. Avoid queuing at bag drop or luggage carousels and hop on and off public transport without having to drag your bags behind you. If you are studying in Lithuania, perhaps as part of your degree, or on a language course, Send My Bag can send all the possessions you will need for your stay in Lithuania. By shipping your things you can bring so much more with you than you could check into the hold of your plane. No matter if you are travelling to Lithuania for a city break or if you are moving to Lithuania for good, you can send your luggage and boxes with Send My Bag. This means you can better enjoy your journey to Lithuania knowing that your luggage is being taken care of. You can pack everything you need to make you feel at home in Lithuania, while avoiding the hassle of pulling heavy bags behind you through airports and onto buses and trains. Instead, your baggage can be waiting for you at your hotel. To learn more about sending luggage to Lithuania, visit our ‘How it works’ page, or our ‘FAQs’. There are currently six golf clubs in Lithuania. The top-rated courses are V Golf Club and Capitals. You can use your very own golf clubs when playing on these courses by shipping them to Lithuania with Send My Bag. Other than being able to use equipment that is familiar to you, you can also avoid having to wait around at bag drop or luggage carousels, or having to drag large golf bags behind you. See more information on how to send golf clubs with Send My Bag, including how to best package your golf clubs. Lithuania has lots of areas of natural beauty for cyclists to enjoy, plus an ever-expanding network of cycle routes. The area bordering the Baltic Sea has a particularly good cycle route. 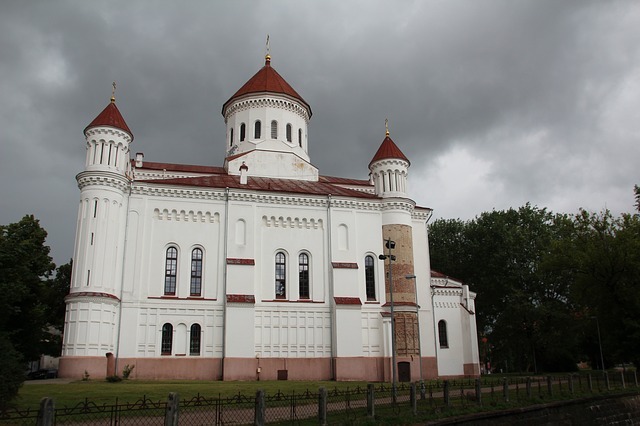 Why not explore Lithuania by bike by sending your bike to Lithuania with Send My Bag? This means you don’t have to shove it into the back of a taxi or onto a bus. Instead it will be waiting for you at your accommodation. Your bike needs to be taken apart and safely packaged up before being sent to Lithuania. Check out our information on bike shipping to learn more. If you are relocating to Lithuania you will have to investigate international removals to Lithuania in order to shift all of your possessions too. Make sure you choose a reputable removal company that you have researched well and that you package up all your items carefully so that they arrive in one piece. Use suitable packaging for your items and tape everything up well. Lithuania has two universities in the Times Higher Education World University Rankings: Vilnius University and Kaunas University of Technology. If you are studying at one of these institutions, or any others, Send My Bag can ship your possessions to your student accommodation, making your move to Lithuania an easy one. Send My Bag can help you ship everything you need to Lithuania, such as books, writing materials and clothes. Discover more about student shipping on our student page and find out how to receive your student discount. You can also send a parcel to Lithuania with Send My Bag. This is great for friends or family who want to send you gifts or care packages. Or, they can send you any items that you may have left behind in your previous location. When sending a parcel to Lithuania make sure you pick a sturdy box and seal it up well so nothing gets damaged in transit. Read more about sending a parcel and find out what you can send with Send My Bag and how to package your items. If you have large bulky items ? such as a chest of drawers or ottoman ? that you need to send to Lithuania, one option you can try is air freight. Transit time is normally one or two days, making it a quick service. This option can be quite expensive, though, with costs increasing as your shipment size increases. A customs agent will need to be hired to sort customs clearance for you. Another expense to consider is transporting your items to and from the airport, which means the price of using air freight could quickly mount up. If you send internationally by air freight to Lithuania your items will likely arrive at Vilnius International Airport. Another option for shipping large bulky items is sea freight or container shipping. Sea freight shipping to Lithuania is much slower than air freight, taking a number of weeks, but it’s typically cheaper than air freight. However, you will still need to pay for the services of a customs agent and will need to arrange transport for your items to and from the ports. When using container shipping to Lithuania, your items will most likely arrive by ship at one of the major sea ports, such as the Port of Klaipeda. Reliable, punctual, easy to follow the bag in transit. Shipments of Personal Effects will require a copy of the owner’s passport and a copy of their flight ticket to be uploaded to their Send My Bag account to demonstrate to customs that they have travelled, or will be travelling to Lithuania from the country they are shipping from. The majority of shipments sent with Send My Bag are not stopped by customs. This is due to many countries offering a duty-free allowance for shipping personal effects. Personal effects are normally viewed as used items that have been in the sender's possession for at least 6 months. So that customs officials know that your shipment consists of personal effects, you must create a short non-generic packing list online, to be written in the following way: "2 x Pairs of Leather Shoes, 3 x Denim Jeans, 5 x Cotton T-Shirt", etc., instead of "10 x Used Clothing". If Lithuanian customs find brand new or commercial items in your shipment, they may charge customs duties and taxes. This means you should be aware of any duties or taxes you may have to pay when sending Christmas or birthday presents to Lithuania. Also make sure you attach all documentation required of you. Customs processes and allowances vary according to country, so we advise travellers to take 5 minutes to see how their particular circumstances and what they are sending will be viewed by Lithuanian customs officials. Lithuania’s capital city is Vilnius, which is a small city with a population of 519, 000. Vilnius can be reached by plane from across Europe, landing at Vilnius International Airport. The city enjoys a spectacular Old Town showcasing baroque architecture. Among the most popular tourist attractions are St Anne’s Church, St Peter’s Church and St Paul’s Church. There is also a KGB Museum, on the site of the former KGB headquarters, which stands as a reminder of Lithuania’s oppressive past. Outside the capital there are numerous areas of natural beauty to enjoy, including the Curonian Spit National Park, a UNESCO World Heritage Site that stretches from Lithuania to Russia. The Curonian Spit is a beautiful example of a landscape of sand dunes and is 98 km long and 4 km wide. There is a road running the length of the Spit, so you can travel it by car (a bus service is also available). The Lithuanian end of the Spit also has a bicycle track from the northern tip to the town of Nida on the border with Russia. Further inland you can enjoy pine forests and lakes, such as Dzūkija National Park, the country’s most extensive forest and largest protected area at 697 km2. Here you can enjoy views of the Ūla river exposure, go kayaking and angling in the many rivers, streams and lakes, and go walking and cycling on the 6 bicycle routes and footpaths. You may also come across some of the small villages within the forest, which speak to a by-gone era, with their wooden houses and unpaved streets.